No reviews last week as Mrs Earth-Prime and I were away. 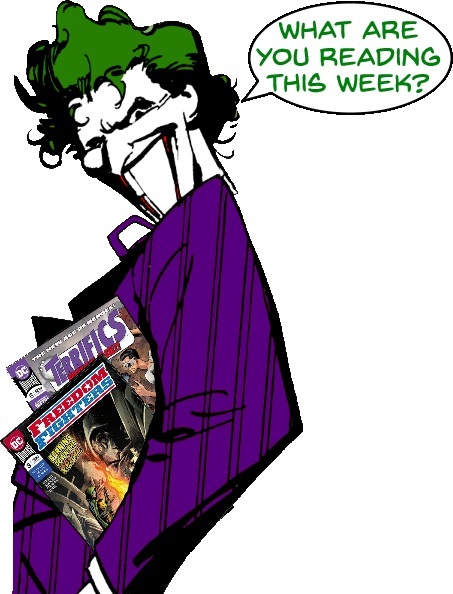 This week, though . . .
Lucy Weber starts to unravel the mystery of what’s happened t Spiral City’s heroes . . . again. This time she has the help of Talky-Walky who seems aware of the reality shift, unlike Lucy. A little bit of a placeholder issue in an otherwise excellent series. The Freedom Fighters strike back against the Nazi regime, hijacking their electronic systems and broadcasting God Bless America by Irving Berlin across the country in an attempt to raise the dormant Uncle Sam. Meanwhile the Fuhrer, Adolf Hitler II, assigns his son – the imaginatively named Adolf Hitler III – to bring down the Fighters. Another cracking issue with a ton of action plus hints into the pasts/origins of the heroes without disrupting the story. Darkseid continues his quest to build something called Sepulkore that will stem the tide of darkness released by the collapse of the Source Wall, but something seems to have stopped him with some finality. Elsewhere, the League arrive on Tamaran only to find Starfire’s sister Blackfire waiting and holding her to account for their planet’s devastation. New writer Dan Abnett picks up the threads of the original story and brings in his own stuff; it’s a little better that previous issues and, having enjoyed his work on AQUAMAN, I’m curious as to where Abnett’s going. In the Funlands, Billy and the family are hosted by King Kid who tells them his origin and wants to join the family, though Mary is rightly suspicious. When it’s revealed she’s nearly 18, King Kid flips and captures her – only kids are allowed in the Funlands, apparently – and this triggers the rest of the family into becoming their adult, heroic forms which means they all get either captured or thrown out into the various other Magic Lands. Another fun issue that moves the story along. I’m guessing, based on his origin, King Kid will be revealed to be an adult after all this time and so defeated by his own rules. Mr Terrific is rescued from the Dreadfuls by Mrs Terrific of Earth-23 who looks just like his late wife and he, of course, looks just like her late husband. The other Terrifics – joined by Offspring and Tesla Strong – track them down in time to stop the Dreadfuls’ final attack. I’m still liking this series so much, partly because it seems to be the only one in the DCU that remembers there’s a multiverse out there – we get glimpses of six other Earths in the last few pages alone. Pick up the collections if you haven’t already. Posted on Sunday, March 3, 2019 Saturday, March 2, 2019 by GaryPosted in ReviewTagged Black Hammer, Blackfire, Darkseid, Freedom Fighters, Mr Terrific (Michael Holt), Mrs Terrific, Offspring, Shazam, Starfire, Tesla Strong. 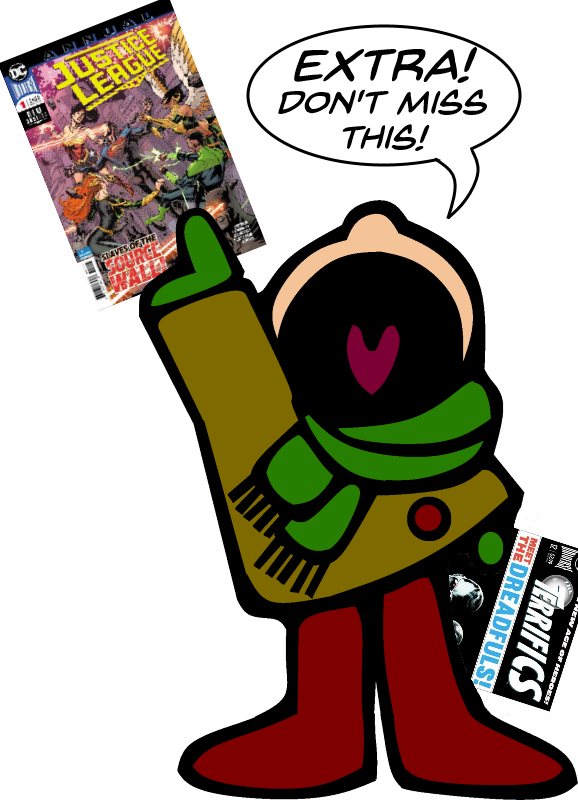 I’ve enjoyed Black Hammer from Jeff Lemire and Dean Ormston and was happy to pick up the new spin-off miniseries, Sherlock Frankenstein and the Legion of Evil. 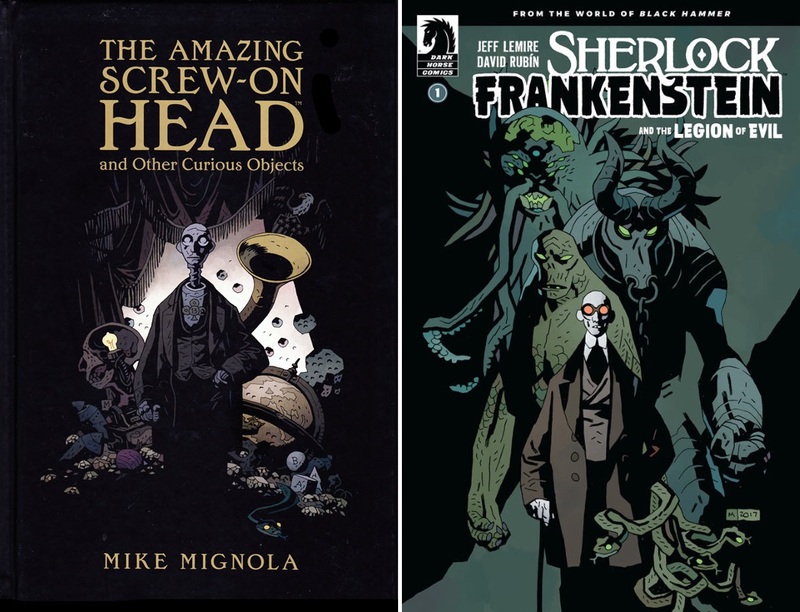 The Amazing Screw On Head is a great collection of short stories but the similarity between the two main characters makes me wonder if Mignola was maybe rushed for time and re-used some old art? Either way, they’re both great covers.